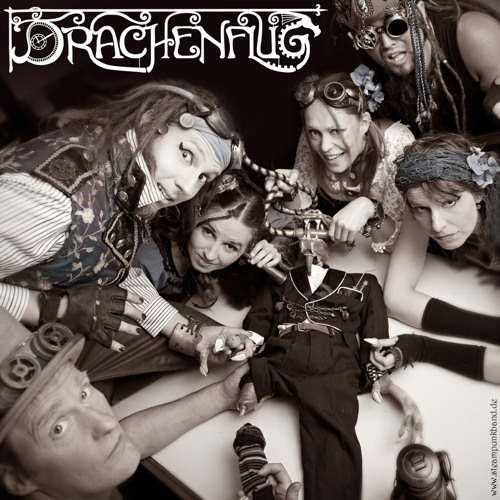 “Drachenflug is a journey through times and dimensions into a world of coffee shops, smokers saloons and into the cewitched forests of a past, that never existed.” With steampunk – until now more of a trend of literature or fashion style – Drachenflug want to set the foundation for a new musical genre. The elements of their music are the sounds of the dawn into a new world of unknown technology : The sounds and atmospheres of a dark and enchanted forests, the whisper and affectation in the smokers saloons and coffee shops during the turn of the 18th to 19th century, the punding of steam-engines and the fluttering of the rotors of an air ship. Their concerts also always want to tell a story, to take the audience with them into a phantasy-world. Drachenflug see themselves as an overall concept. Clothings and instruments are designed just as affectionately and artistically as their music. At this program also electronic instruments and own inventions are to be applied. Only own compositions are played here. Drachenflug was found in spring of 2005 and since then played with varying members on several Renaissance fairs (among others: Spectaculum Hamburg Öjendorf), festivals (Festival Mediaval 2012, Wave Gotik Treffen, Leipzig 2008, Hörnerfest 08/09, Brande-Hörnerkirchen), the award for literature Buxtehuder Bulle and village fairs (such as Hansetage Lippstadt) plus as a support act of bands like “Faun” or "Rapalje". The album of the band “Blau” was released in august 2010.